Back in September I attended the Berkshire WoodWorkers guild show in Stockbridge, MA. It’s an opportunity for members to display and sell their work. The craftsman are varied in age, gender, and design sensibility. It’s a small show and I’m always surprised that there aren’t more active members, given the creative nature of the Berkshires. Each year there is a silent auction of smaller projects from members. 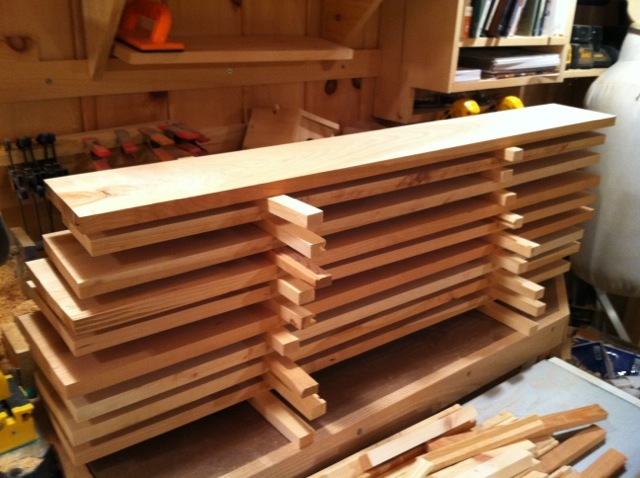 This year there was a “handcut dovetail class” on the auction block. Starting bid was $90. I’m in! I signed my name and was the 1st to bid, we then went and wandered the show. As I stated, designs and skill levels are varied, and you know how it is, you wander a show and there are certain pieces and artisans that you respond to more than others. Towards the end I came upon the booth of John Corcoran. His work was traditional, well done and obviously created with a skilled hand. As I admired his work, we sparked up a lively conversation. He spoke of his work and where he has taken classes. It was then that it occurred to me the John was the one offering the dovetail class. Perfect I thought! Well as luck would have it, I got a call later that week that I had indeed won the auction. Score! The sad thing is, no one else apparently bid. I must say I was surprised. Like many of you, I want to see more folks participating in the hobby we find so enjoyable. Ah well, their loss, my gain. I was very excited. 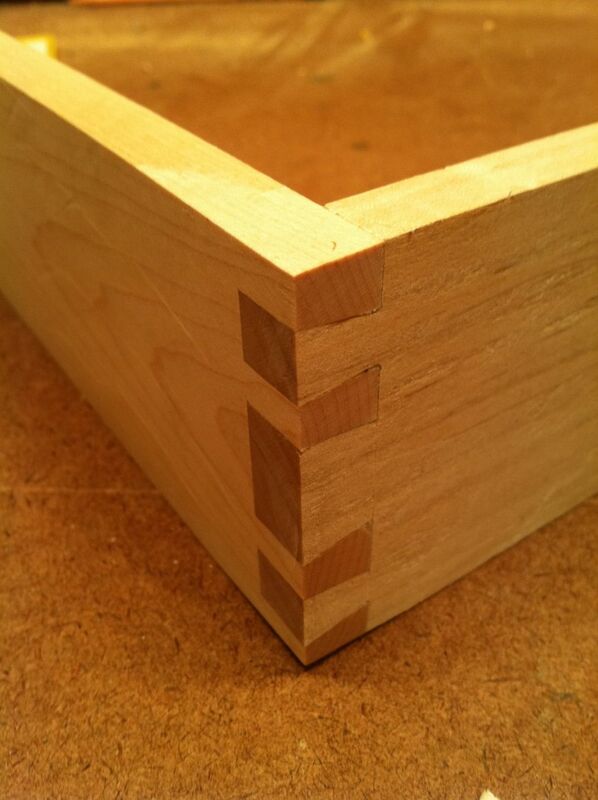 I’ve taken a number of woodworking classes, but handcut dovetails were never really covered in great depth. I can machine cut dovetails and I’ve even handcut single dovetails for joinery, but not for a traditional use such as a drawer. 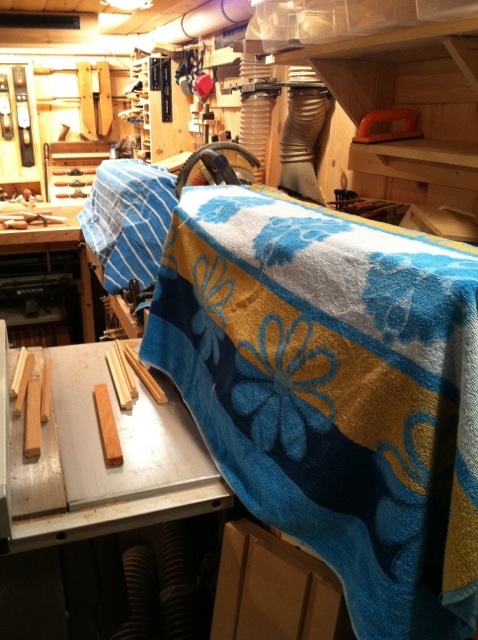 In fact, last year I built a shaker table as part of the Woodworkers Fighting Cancer build with The Woodwhisper Guild. Sadly the table has sat in my shop awaiting a drawer. It just seemed to me to be one of those projects that calls for handcut dovetails. I didn’t want to use a router jig for a 3″ drawer, and I didn’t want to cop out and use a rabbit joint on this very traditional table (I am a member of the Hancock Shaker Village after all!). So the table sits, collecting dust until my skills (& confidence) are up to it. So after lots of phone calls back and forth, John and I set up a Saturday morning for my private lesson. John, a former engineer, has spent his retirement pursuing his woodworking dream, building a shop and honing his craft by taking extensive classes. 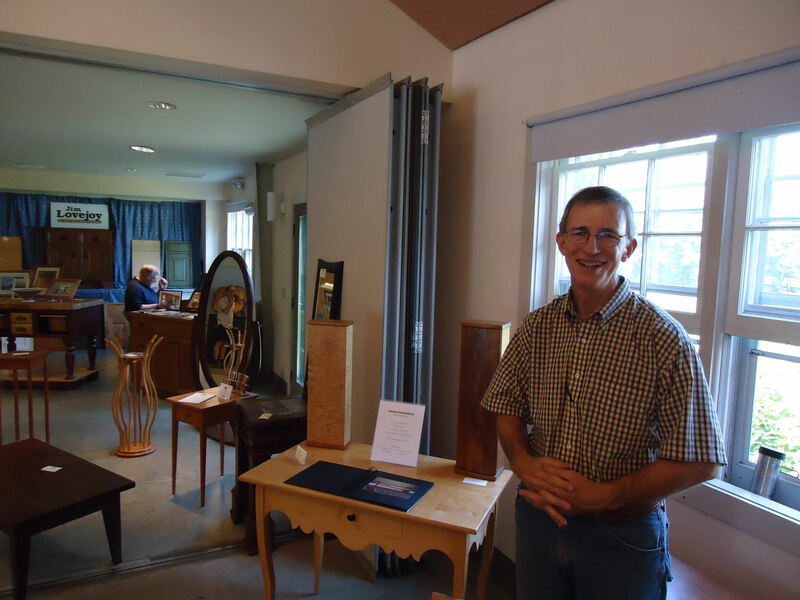 An avid fan of Krevnov’s work, he spent three weeks out at the College of the Red Woods Fine Woodworking Program sharpening his skills, as well as several classes at the Center for Furniture in Maine. We headed out to the shop, where John had laid out an impressive display of tools for us. He was very organized, including a step by step printed hand out. This wasn’t going to just be a couple of hours hanging in the shop! This was a one on one tutorial. We briefly went through the various tools and he got straight to it. He showed me how he does the layout and then he let me lay it out, he showed me how he cuts this pins and then I cut my pins, and so forth. This was great. I thought, this is how woodworking classes should be, a couple of hours zeroing in on just one skill, in a casual shop atmosphere and no distractions for other students at different levels. 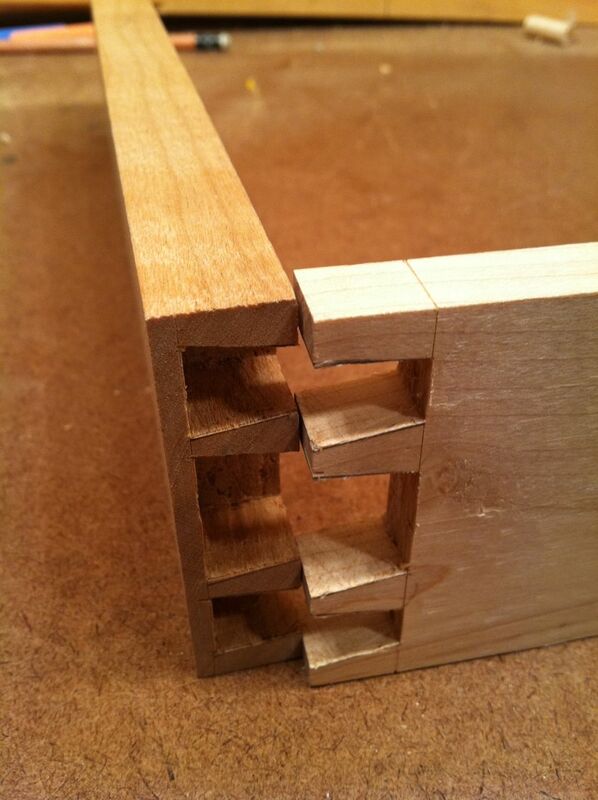 We covered both through and blind dovetails. John is a “pins first” kinda guy, which makes sense to me. So we’ll see, perhaps that makes me a “pins first” guy as well! His technique is quite similar to Kari Hultman’s video shown here. 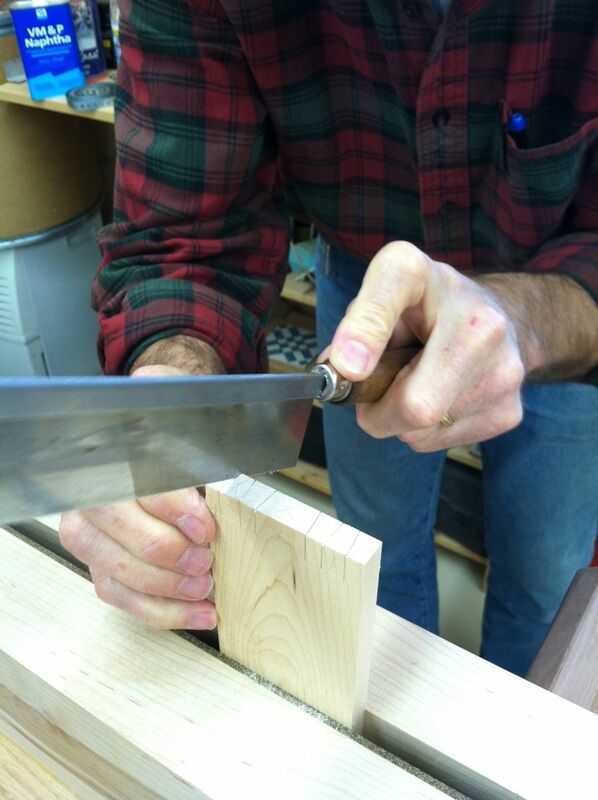 John also uses a block, clamped down at the shoulder, giving the chisel a surface to reference off of (very smart!). Unlike Kari and others, John does not use a fret saw, which I was happy about. I have not really tried the fret saw, but I like using the chisel to remove all the waste. John also introduced me to a simple method of twisting the chisel to remove larger pieces of waste. It’s those small techniques that make classes so valuable. Well, time flew and before we knew it we had worked though lunch. John’s wife was kind enough to prepare some sandwiches and we sat inside and chatted for at least an hour! 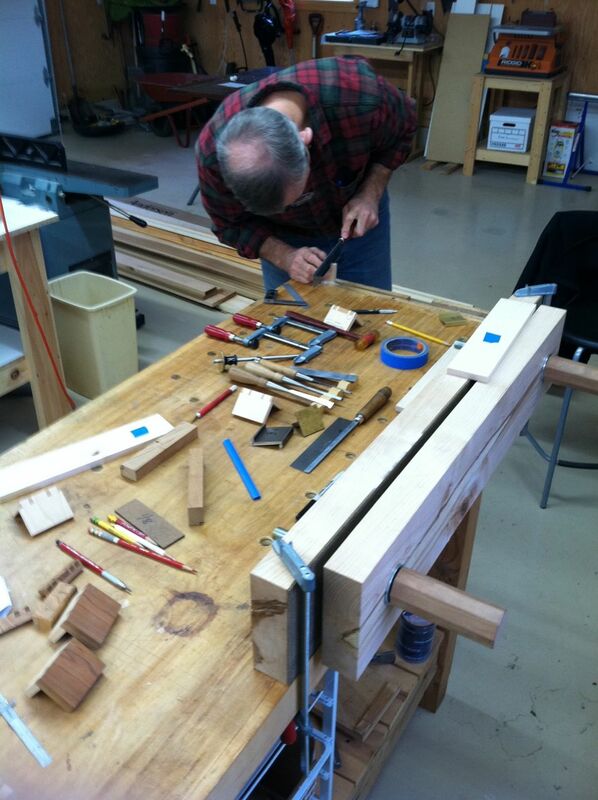 It’s true what they say about woodworkers, we are a kind bunch (and so are their wives!). Although it was only October, we were hit that day with a freak snow storm. As we sat in their house the snow continued to come down, I looked out and decided I better get on the road. I could have stayed all day, but I would have to finish up my blind dovetail at home. …except for cutting my blind tails as both pins! I guess I need to hire full time to look over my shoulder! Please take a moment to check out John’s work here. He is a true gentleman, a talented woodworker and a new friend. Quite a weekend in the Northeast! 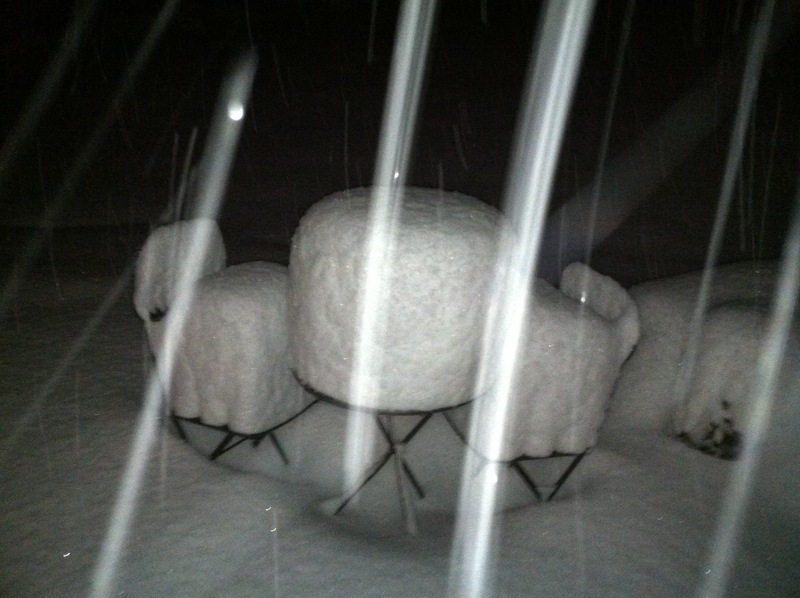 We got a little dusting this weekend! I started the weekend with a private dovetailing lesson (more on that in the next post), when the snow started coming down, and boy did it come down! By the time we were done we had 20″!! We live on a mountain that seems to have it’s own climate. It could be dry in town, and we could be have a blizzard at our house. But in this case, as you know, the Northeast got hit pretty hard witha pre-Halloween storm. Our accumulation is just more than yours! So my kids played in the snow, my wife sat, curled up reading her ipad and I headed to the shop to get going on the twin cradle. Life is good! I must admit, this is the most unsupervised milling I’ve done to date. I’ve got a powermatic 8′ Helvetica jointer and a dewalt 735 planer, which I’ve used for small projects, but this was what I bought the powermatic, a serious project with beautiful stock. Enough messing around, it was time to put this machine to the test. I was not disappointed. I was treated to smooth, easy cuts that revealed the beautiful grain and color of the cherry. Awesome. A little back story on the jointer and planer. 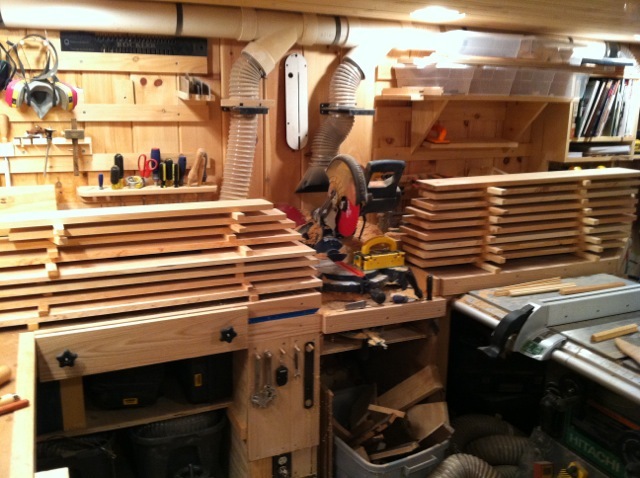 As I starting getting serious about woodworking several years back, I realized, as many do, that this was going to require a little more precision, both from the wood and the tools (and of course me!). 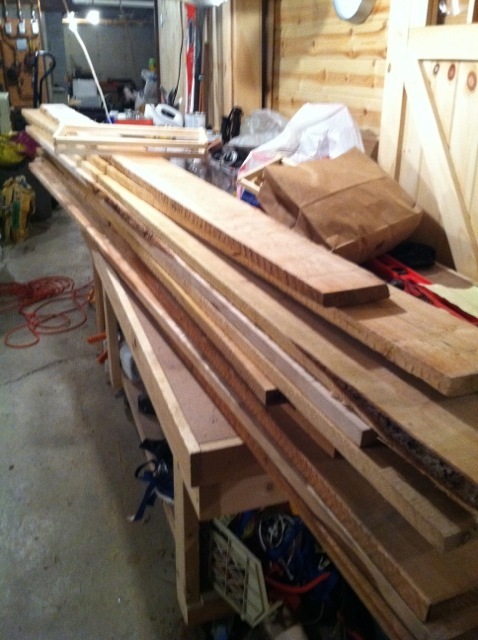 You see, wood needs to be dry and square and….well, lets assume you know that if your reading this blog! But seriously, it wasn’t that long ago when things like that were like a light bulb going on in my head. At this point hand tools were still more intimidating than power tools, so I went the power tool route. After doing some research and looking at what I could afford, I decided on a Jet JJP-10BT Planer/Jointer combo. Talk about a deal! I could get BOTH machines in one for around 400 bucks!! Awesome!! It’s a two-fer! Well you know how this story ends. In fairness, the jointer portion worked ok, but the planer really never worked right and switching the machine between the two operations wasn’t a nightmare, but it was just stupid. So I have a $400 collecting sawdust in the basement. Low ball offers are being accepted. So like all bad relationships I moved on. I saved up and bought the Dewalt 735 on sale at Lowes and when Amazon had a sale on powermatic tools I jumped on it. Of course I had to get their awful credit card, but it was 0% financing for 18 months and 20% off. Such a deal! I can justify anything. As the old adage goes “you get what you pay for”. I saved, I paid for quality and I’m really happy. Both machines did not let me down. It almost seemed like I knew what I was doing! 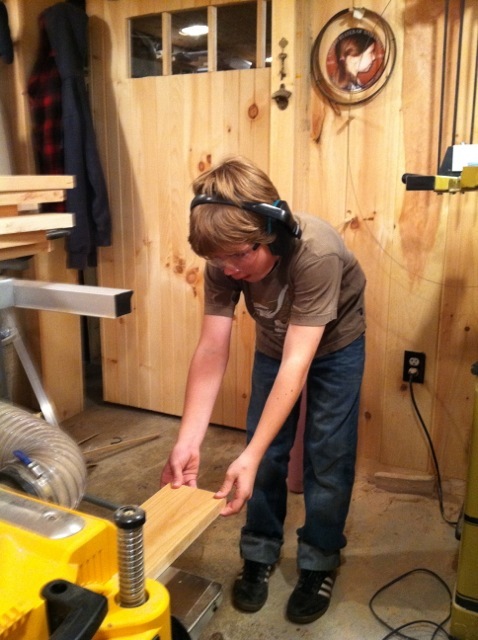 The best part of the day was spending time with my assistant in the shop. 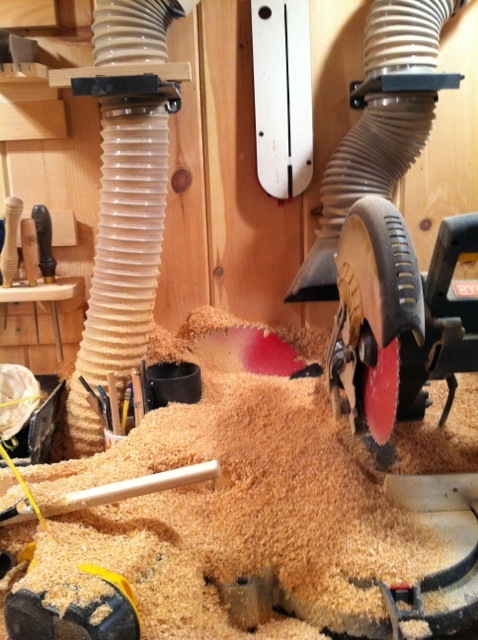 *Milling wood creates lots of saw dust. Empty dust collector before it backs up all over shop. Done! All square and ready to go.